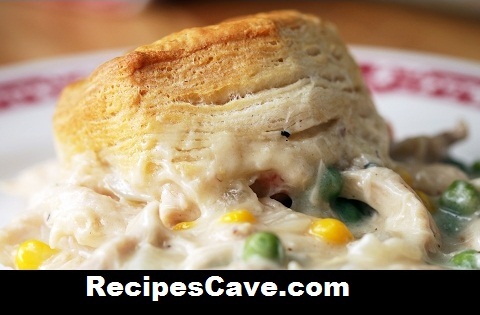 Chicken & Biscuits Bake Recipe - Biscuit with chicken what you think will it tasty ? This is gonna a fantastic recipe if you did not tasted ever. Let me show the procedure how to cook chicken recipe with biscuit bake. In a large pot over medium-high heat, melt the butter. Add the onion, stir until softened. About 1 minute. Whisk in the flour, stirring constantly to prevent the flour from browning. About 1 minute. Whisk in the chicken broth, salt, and pepper. Continue to whisk until no lumps remain. Whisk in the heavy cream. Bring to a light simmer until the sauce has thickened slightly. Test for additional salt/pepper. Add the mixed vegetables and shredded chicken, stir until fully incorporated. Transfer to a 9x13-inch baking dish. Evenly top with 12 pieces of biscuit dough (you will have extra biscuits, which can be baked off separately). Bake in a preheated oven for 20 minutes, until the biscuits are golden and the gravy mixture is bubbling. your Chicken & Biscuits Bake Recipe is ready to taste.